Earth Kitchen. Image courtesy of Earth Kitchen. It’s finally beginning to feel like Spring and, barring the odd April snow shower, the prospect of warm weather, shorts and dining outdoors feels tantalisingly close. Make that first pilgrimage of the season to the ever-gorgeous Towpath, get loose in Shoreditch with cocktails and red sauce, or revel in the best Scottish seafood at one of London’s most buzzed-about new openings. There’s that, and plenty more, in this month’s Hit List. Because when Jackson Boxer opens a new restaurant, you don’t ask questions—you just go. The city’s chef du jour, his latest pays tribute to the Hebridean island on which he spent his childhood summers. 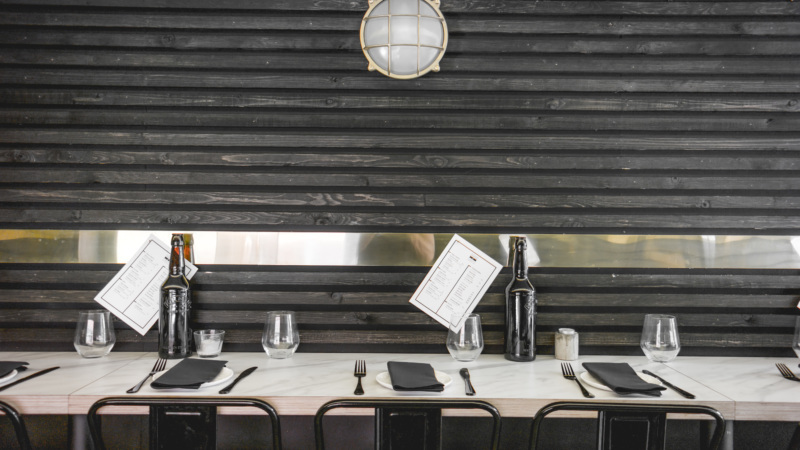 Tucked away in Notting Hill, this new Scottish seafood-centric spot sees Boxer team with chef and friend Andrew Clarke, focusing on the light, modern dishes that forged the duo’s rep as two of the city’s most dynamic talents. Meanwhile, a slinky, intimate dining room and stellar wine list guarantee one of the most thrilling dining experiences anywhere in the city right now. Because where else can you eat a kebab tasting menu at a dedicated chef’s counter? Several years in the making, much care and thought has gone into Kebab Queen, a labour of love from the founders of Le Bab and Maison Bab. Admittedly, it’s hard to improve on a really good shawarma (something the owners freely attest to), but the menu is the restaurant’s own spin on an underappreciated culinary staple, helmed by a former Le Gavroche chef. Seats are already filling fast though, so be quick. Because nothing guarantees a great night out like wine, old-school glamour, and copious amounts of pasta and tiramisu. Occupying a prime site in Shoreditch, Gloria comes from French restaurant group Big Mamma, who are known for their raucous Parisian nightspots. An over-the-top interior—think extra flower displays and gorgeous Italian decor, à la 50’s Capri—is matched only by heaving plates of beef carpaccio and cacio e pepe mixed in a huge wheel of pecorino. Subtle it ain’t, but a night here is a guaranteed blast. Because beats, rum, and rotis make for an unbeatable combo and right now, Island Social Club does it better than anyone. Caribbean culture is a huge part of London’s urban identity, and this year-long residency at Haggerston’s Curio Cabal celebrates it brilliantly. There’s a joyful lineup of dishes like jerk wings, pepper shrimp and 24-hour marinated curry mutton that explore the foodways of the Caribbean diaspora, along with those flaky rotis that are perfect for mopping up excess gravy. Meanwhile, a thoughtfully-chosen lineup of rums make for perfect cocktails, and the owners regularly host music, spoken word and community events each week. One not to miss. For reservations, call the restaurant on 020 7254 4945. Because it perfectly encapsulates everything that makes London such a spectacular place to eat in 2019. Nicholas Balfe’s follow-up to Salon is a corker—an all-day bistro in Peckham serving light, modern dishes that delight as they beguile, and a vibe closer to a buzzing wine bar than a stiff dining room. Share a few dishes (the celeriac ravioli and boudin noir are amazing) and luxuriate in a wine list that’s especially strong on bottles from Jura. Getting in may be a bit of a faff (they’re almost permanently booked), but it’s worth the effort. For reservations, call the restaurant on 020 7732 2256. Because this tiny Clapton wine shop is arguably the most exciting place to eat in the entire city right now. Known primarily for its killer selection of natural wine and rotating lineup of guest chefs, P. Franco sees new kid Túbo Logier take over in the ‘kitchen’ (really, just a few induction hobs at the back of the shop) from the 11th. With experience in some of Europe’s best kitchens, expect plates to reflect his cutting-edge training with influences from his Southeast Asian background—all, of course, dished up with the restaurant’s signature bonhomie and informality. Because it’s established itself as one of the city’s go-tos for brilliant British cooking, just weeks after opening. Based in one of Hackney’s most progressive arts venues, chef Chris Gillard oversaw the St. John group’s kitchens for over a decade—no mean feat—and brings a similar gutsy, no-nonsense ethos to Earth. The large, comfy room is perfect for quick lunches during the week and lazy brunches at the weekend; meanwhile, dishes like a humble pigs cheek salad have earned it the critical nod (In Jay Rayner words, “designed to make those with encouraging appetites sigh and perhaps weep a little with happiness”). Because nothing heralds the return of spring like a visit to this canalside gem. Those in the know set their calendars by this tiny cafe’s beautifully simple and ultra-seasonal cooking. The best dishes are written up on the blackboard each day, like spring peas and broad beans with creamy ricotta or a wonderful smoked mackerel with pickles. Order a drink, take a seat at the cafe’s brightly-coloured tabletops by the water, and soak it all in. Because Wei Guirong, one of the best Chinese chefs in the city, finally has her own restaurant. As Shaanxi-style Chinese cuisine snaps at the heels of old-school Cantonese in popularity, we’d advise getting familiar with the classic eats popularised at places like Xi’an Impression in Highbury—not coincidentally, the restaurant where Wei was head chef for years. Feast on incredible biang biang noodles, flavoursome cumin lamb buns and dumplings, and prepare to have your perception of Chinese food turned on its head. For reservations, call the restaurant on 020 7209 6888. Because in uncertain times, this is the one restaurant we can all rely on for fabulous food and service. Margot Henderson and Melanie Arnold’s classic Shoreditch restaurant helped set the blueprint for the gutsy, seasonally-driven British fare that’s found its way into the country’s best restaurants and pubs. The effortlessly tasteful DNA of the original has proved itself a perfect foil to the ICA’s coolly artistic sensibility; savoury pies and tarts are a speciality, but truthfully, everything from a plate of whipped cod’s roe and radishes to a bowl of the season’s new potatoes is a delight.